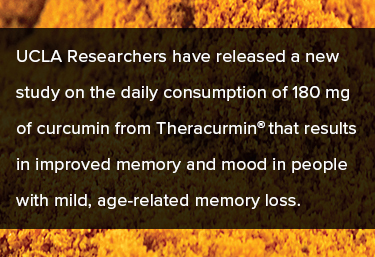 UCLA Researchers have released a new study on the daily consumption of 180 milligrams of curcumin from Theracurmin® that results in improved memory and mood in people with mild, age related memory loss*. Dr. Gary Small led a team of researchers to determine the impact of a specific form curcumin on memory performance, and the presence of microscopic plaques and tangles in the brains of people. Dr. Gary Small is the director of geriatric psychiatry at UCLA’s Longevity Center and the geriatric psychiatry division at the Semel Institute for Neuroscience and Human Behavior at UCLA. The double-blind, placebo-controlled study involved 40 adults between the ages of 50 and 90 years who had mild memory complaints. Participants were randomly assigned to receive either a placebo or 90 milligrams of curcumin from 300 milligrams of Theracurmin twice daily for 18 months. The verbal outcomes of Buschke Selective Reminding Test improved with Theracurmin® (ES = 0.63, p = 0.002) but not with placebo (ES = 0.06, p = 0.8; between-group: ES = 0.68, p = 0.05)*. “The study results provide healthcare professionals with FDDNP-PET findings that suggest meaningful cognitive benefits. *” said Bob Doster Ph.D. Click here for the full details of this study. Dr. Bob Doster earned his integrated doctoral degree in food science and nutrition and consults for Integrative Therapeutics. Along with holding numerous U.S and foreign patents applicable to food and nutritional technologies Dr. Doster has a passion for truly understanding how things work.